As I always say: what is the point of getting up at 3 am, driving for 2-3 hours, potentially getting drenched by rain, getting cold or being completely eaten by mosquitos, all for a piece of meat which you going to marinade for 24-48 or – God forbid – 72 hours? The game needs to be natural, simple and real and there are thousands of recipes out there for some amazing dishes from any game meat you can imagine. 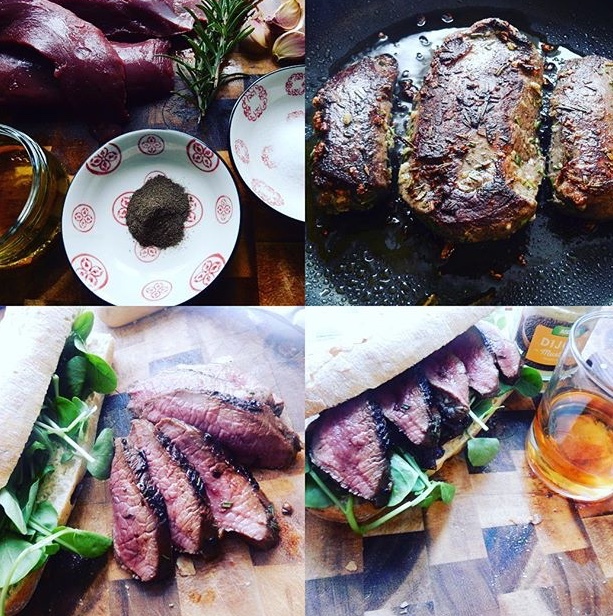 But I’ve chosen venison sandwich for its amazing simplicity and the personal options you can add to it. Fry the fillet on all sides until brown and then place it in the oven for 4-5 min on 180C for medium-rare. While frying the fillet, start caramelising your onion with sugar and good amount of balsamic glaze, “butterfly” your ciabatta, drizzle it with olive oil and put it in under the grill. After 5 min in the oven, remove the fillet and set it aside to rest under some kitchen foil. When the ciabatta is crispy and golden, take it out from under the grill, then spread butter on one side and mustard on another side (generously). Meanwhile, the onions are caramelising nicely and the fillet, once rested, is ready to slice. Spread the onion on the buttered side and put the sliced fillet on top. Season the meat with salt and black pepper then top it with some spinach or any other salad you prefer. What else do you need from life: amazingly cooked meat, good brandy and a good fire crackling away in the fireplace. There are so many recipes I love and the best ones are usually the simplest. Keep it simple, keep it real, keep it natural. And for you, what’s your best game sandwich recipe?